Click on the image to visit a larger version at the website of Professor John Dower of MIT, who also has more about the Japan of this era. Anyway, some things just WORK, happiness-wise. Like, David Tennant as Dr Who. Like, gratuitous, yet sensitive, use of the synthesizer. Like, imagining, even for ONE MINUTE, that at some point, your email inbox will be empty. But, more than any of those things (although, depending on the episode, David Tennant as Dr Who is hard to beat) happiness is browsing random keywords on Google Book Search. From 1873 to 1887, especially in the last three years of that period, the adoption of European dress progressed rapidly amongst the upper classes. It had been made compulsory for officials when on duty in 1873, and had steadily gained ground amongst students, bankers, merchants, and others coming, more or less directly, under foreign influence. The wave of German influence that swept over Japan from 1885 to 1887 carried the innovation to a still more dangerous point. The beautiful costume of the women of Japan so absolutely becoming to its wears that one can hardly imagine them clad in any other way, was threatened, and sad to relate, the ladies of the Court began to order dresses from—Paris? No—the pen almost refuses to chronicle the appalling fact—from Berlin! In the nick of time, the reaction against a Slavish imitation of Occidental customs unsuited to the country came to the rescue. Did you get that "Slavish" imitation bit? I wish my pen would almost refuse to write when I try to make bad puns like that. Anyway, if you're feeling a bit low, start playing with Google Book Search (for maximum enjoyment, I suggest limiting your search to "full text" books only — under "Advanced Search"). Oh, and a hearty Dress a Day welcome to our newest advertiser, over there on the right: Michelle Lee's Patterns from the Past! Go check out her site, if you will. I didn't think I had a picture of the first dress I ever made, but I do. The only thing is, I'm not wearing it. 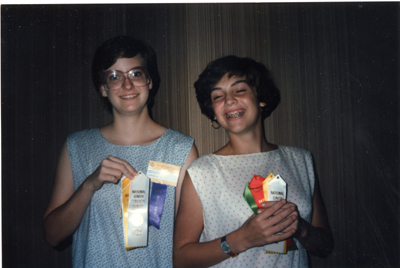 That's me, on the right, in full nerd ectasy, clutching the ribbons I won at the NJCL Forum in 1986. I don't know if that was the year I got a first in Phrases and Mottoes, or if that was the year I got eighth in Latin Grammar by christmas-treeing the ScanTron bubbles, or if that was the year I got eighth in girls' shotput by the simple expedient of there being only eight competitors in the girls' shotput, but it really doesn't matter: I was very happy to be there. Can't you tell? I'm wearing the dress my mom made for me (while I watched her do it, so I could learn how to sew). It was very long, almost ankle-length, and made of baby cotton with pink rosebuds on it, and I had never loved a dress in my life the way I loved that dress. Even Keith Morgan (who made homeroom "interesting") announcing that it made me look pregnant (and asking me, repeatedly, who the father was) couldn't kill my love for that dress. My friend N. is wearing the dress I made. She hadn't packed a dress for the dance, so I lent her mine. 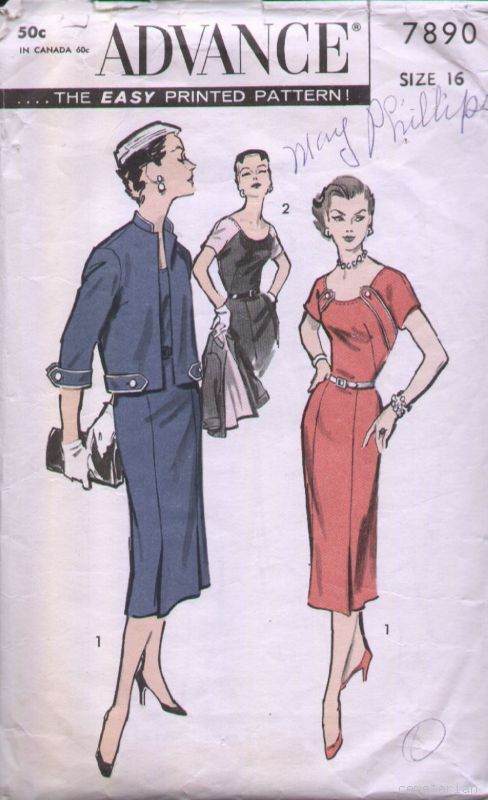 It was almost the same pattern as the rosebud dress, but with more scooped neckline, and shorter. Why I didn't lend her the longer one, as she was so much taller than I was, I don't know. I'm sure I had a good reason at the time. It's weird to see the embryonic Erin-style in this photo, to see what's the same and what's different. I always wear my glasses now (I always wore contacts then). I no longer have braces, thankfully, and I haven't been that tan since I stopped living in Florida. I still wear hoop earrings (smaller ones). I'm still obsessed with Swatch watches, and I still have that paisley one. 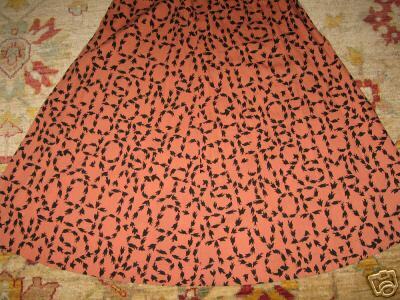 I think if I could find that fine baby rosebud-print cotton again, I'd probably make another dress out of it. And, in case you're wondering, we had a great time at the dance. 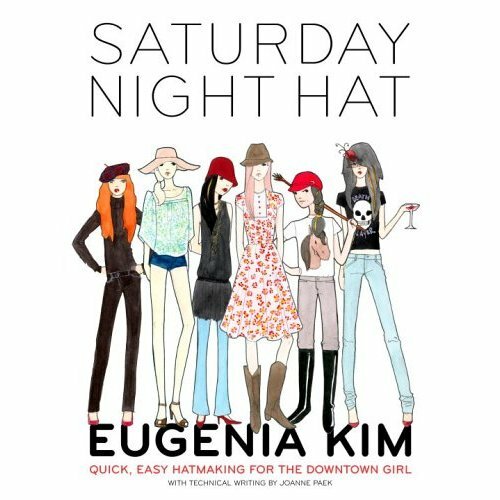 Caroline was nice enough to send me a copy of Saturday Night Hat by Eugenia Kim, and I *really* like it. First of all, and I know this is the kind of thing only an editor would notice or appreciate, but one Joanne Paek is given credit, right on the cover, for technical writing. That's awesome, because, well, technical pattern writing is HARD. And no matter how good you are at the doing, the writing of the doing is a completely different skill. I really admire Kim (and her publisher, Potter Craft) for not only hiring a technical writer, but giving her prominent credit. That's a sign of a generous spirit and consideration for the readers. And that generous spirit continues through the book. Kim outlines half-a-dozen classic hats with as many variations each. I'm not especially a hat person (okay, I love hats, but that thing you do when you look in the mirror and take one thing off before you leave the house? What usually comes off, in my case, is the hat) but I'm definitely going to make her beret, and probably the cloche and the fedora as well, if I can figure out a way to keep the latter two from fighting with my glasses. Some of her hats are worth wearing contact lenses for, and that's saying something. Thank you, Caroline! What a great book! 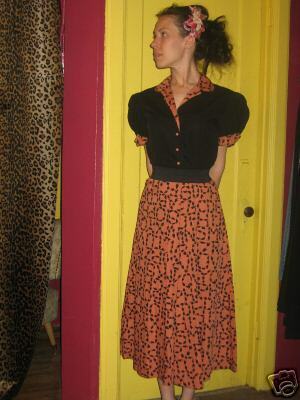 Carol (of Dandelion Vintage) sent me the link to this auction, which I missed. Completely whiffed. Got behind on my email from being away (>800 real, that is, non-spam, messages) and flat-out didn't get to it in time. Which is a shame, because LOOK! Yep, those are little blackbirds spelling out letters of the alphabet. Why? I don't know, but I don't much care, either. I just love it. Of course, it's probably a good thing that I didn't bid, because I don't know if I would have gone up to $141, which is where the auction ended. And of course I haven't really been wearing my vintage stuff all that much lately, so perhaps I would have spent the $$ and then let it languish in my closet. Better for it to have a good home, with someone who will wear it in the sunshine. Or, you know, a smoky bar. Wherever. As long as it's worn. However, I have absolutely put these pics in my file labeled "For the Glorious Day When I Have My Own Fabric Mill," because I really want blackbird-alphabet fabric. I also want hedgehog alphabet fabric, too … just in case you see any of that around. I'm a bit cranky today, so I'm glad to be able to show this dress, which is listed by Chez Cemetarian. You know that cranky feeling you get when you've tried to talk someone out of doing something stupid, something that might well backfire on them, and they go and do it anyway? That's the cranky I have today, matched up with a little bit of a head cold. Somehow looking at this dress makes it slightly better. I really like the completely superfluous straps. I think this would be a great dress for a gangster moll in a movie, because you KNOW, at some point, the Bad Man She Loves In A Hopeless Way will grab her by those straps. And you will have known that the Bad Man will do that from the first moment of seeing her in this dress, but no matter HOW MUCH you yell at the screen, she will never stop loving the Bad Man. The two-tone version is pretty great, too, and of course, the jacket. But it's the moll in red who first caught my attention. 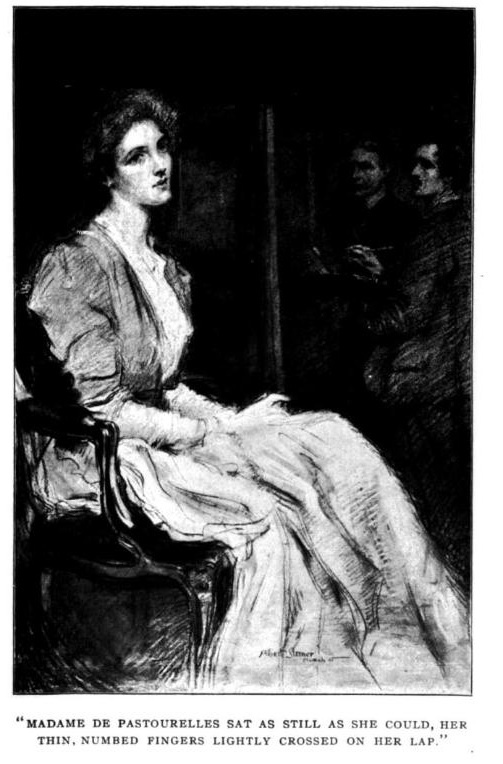 Why won't she realize that the Bad Man is wrong for her, and that she should rat him out to the handsome G-Man instead? Because you can't talk people out of doing stupid things, that's why. First of all, I have been looking for an excuse to link to Elisa's Bodacious House of Style for a while. I missed my chance during her 'pose-off' with Fred, and I keep checking her store waiting for something to demand to be a post, but have had no luck so far. But now she's scanned the newspaper article above, and so I can post it and credit her. Yay! The O’Brien and Shelton study of 1941 did not result in a sizing standard until the 1950s. In 1958, the U.S. Department of Commerce issued a new commercial standard known as CS 215-58 based on the 1939 study. This standard used four classifications of women (Misses, Women’s, Half-Sizes, and Juniors), three height groups (Tall, Regular, and Short), a bust measurement, and three hip types (Slender, Average, and Full) to classify sizes (U.S. Department of Commerce, 1958). The sizes were based on bust measurement, height group, and drop value (difference between hip and bust circumference), and yielded over 20 sizes for use by the apparel industry (Chun-Yoon & Jasper, 1993). However, this standard was only voluntary, meaning that manufacturers did not have to follow it. They could either revise it to fit their needs, use it as it was created, or disregard it entirely. In addition, it was based on the 1939 study by O’Brien and Shelton, and thus suffered from the same inadequacies that the study had. Due to these problems, women of the 1950’s and 1960’s attempted to get around a growing size problem by using corsets and girdles to mold their bodies to the shapes of the clothing produced (Agins, 1994). Despite these problems, the next step in the history of sizing standards did not occur until 1971, when the U.S. Department of Commerce released a new voluntary standard, known as PS 42-70. This standard was basically a revision of the previous standard CS 215-58, but did include modifications based on a health survey performed by the National Center for Health Statistics in 1962. This survey indicated that U.S. adults were taller and heavier than they were in 1940. Thus, the bust girth was increased by one grade interval per size code for all figures. Other changes from CS 215-58 included the elimination of “Slender” and “Full” hip options for all figure types as well as the elimination of the “Tall” option in the Juniors’ and Women’ figure types (U.S. Department of Commerce, 1970). Even with all of these changes to the CS 215-58 standard, the new PS 42-70 standard was still voluntary and based on the 1939 study by O’Brien and Shelton. At this time, still none of the problems with sizing systems had been confronted.